This is a list of material written about, or in, the Tomorrowlands universe. PLEASE NOTE: I lost many of these stories to a server crash some years back; I'm still reassembling the page from archive.org and from my own files. Some links on this page are still broken. If I'm missing one you want to read, please contact me and I'll find it for you. I also haven't updated this page since 2003. More recent material can be found on the TTU Wiki -- check out its Stories page, and its Culturalia page, in particular. Do you want to contribute to the TTU canon? Read the contribution guidelines, take an idea, and run with it! All stories written in the Tomorrowlands universe will be linked to from this page. If you've got some time to spare, immerse yourself in one of these tales. Just don't blame me if the sun rises as you're finishing Chapter 23. Titania's Toys, book 1 (novella) -- A mage faces life as a blow-up when a life spell blows up in her face. Then she gets a colleague involved. Then ... her family finds out. 38 pages in four parts: <<1 2 3 4>>. By Silussa, 12/2001. Content warning: Explicit sexual scenes. Adults only, please. 49 pages in five parts: <<1 2 3 4 5>>. By Silussa, 9/2002. Content warning: Sexually suggestive material. Mature audiences. Prose set in the Tomorrowlands, of a size amenable to being read in a single sitting. The Beach Incident (short story) -- Even if The Changes catch you off balance, you should do your best to stay centaured. 3 pages. By Orion Sandstorrm, 6/2002. Birthday Present (precision short story) -- A 250-word (no more, no less) vignette on a young boy's discovery of therianthropy. 1 page. By Baxil, 7/2001. But The Garden Has No Apples (short story) -- Not everyone appreciated the Changes equally; and quite a few had to decide what to make of a mixed blessing. 8 pages. By Baxil, 4/2001. Diary of David Mordred (short story) -- The Changes meet "Metamorphosis" in this tale of one of TTU's most singular therianthropes. 9 pages. By Thrames, 7/2002. Faith (short story) -- Thou shalt not fear the Lord ... until His servant takes matters into his own hands. A dark TTU tale set in England. 11 pages. By Onissarle, 11/2001. Content warning: Sexually suggestive scenes. Violence. The Fringe (short story) -- It's one thing to call oneself a mage ... but what does it all mean? Especially when magic's gone mainstream? 9 pages. By Kaijima Frostfang, 7/2001. Kenneth (short story) -- The worlds of magic and mundanity collide for a young man in the early days after the Flyby. 10 pages. By Cattywampus, 4/2001. Learning Experiences (short story) -- As Ash gives magic pointers to a young woman in the Midwest, he's interrupted by a man with a chip on his shoulder and an ace up his sleeve. 19 pages. By Baxil, 2/2002. 1 page. By Delcan, 3/2003. Scatterlings (short story) -- In which a familiar personage gets mistaken for a tourist, learns some Mexican slang for "therianthrope," and drinks the best glass of lemonade he's never had. 10 pages. By Baxil, 7/2002. Snow (short story) -- The dead of winter tell no tales. 5 pages. By Tchjdaedn, 8/2002. 5 pages. By Den Whitton, 8/2001. Cultural artifacts from a world much like our own -- a collection of essays, songs, opinions, and detritus collected from within TTU. The Death of Teleportation (essay) -- After The Changes, magic was poised to turn society upside down. Then our dreams started dying one by one. "What happened?" asks a Boston mage, focusing on arguably the most revolutionary magical advance possible. Offertory (song lyrics) -- Las Vegas singer Sheen searches for the perfect gift for her beloved. Also includes a brief review of her early performances. Over the Horizon (song lyrics) -- The first song by a fully nonhuman band to reach the Top 40, rewritten years later in celebration of New Atlantis' founding, and presented (with extensive liner notes) in its revised version. Three Wolves (song lyrics) -- A blues riff on how society can break those who aren't ready for it, inspired by a late night of drinking with a unicorn. Top Cats and Tales (interview) -- Las Vegas singer Sheen, a self-described "cat person," reflects on fame, relationships, science fiction, and theri empowerment. 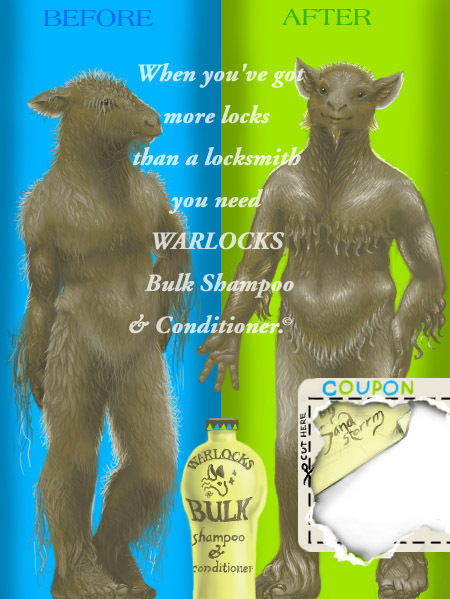 Warlocks Shampoo (advertisement) -- It's a basic rule of capitalism that products grow to fill available markets. When dealing with therianthropy, the rule still holds. This is the place for Tomorrowlands "meta-writing" (items written for exposition, or random information about the world), multimedia, or ... well, whatever. The Closed Door (poem) -- A door too easily opened is always suspicious ... but we do not linger on how easily one will close. Death By Zen (essay) -- What happens to theris when the power of belief hits a wall. Dragon Do and Dragon Don't: Flight safety (cartoon) -- A piece of worthy advice for TTU's young therianthropes from the Dragon Do and Dragon Don't series of cartoons. How To Become a Therianthrope in Four Easy Steps (essay) -- This highly detailed guide for TTU writers explores almost every facet of therianthropes' transformations, and should be considered the story universe's definitive rules thereof. Shadows (comic) -- When you hide from your dreams, what is there left? This is a list of writings set in the Tomorrowlands universe, but which aren't strictly accurate to the world, or are otherwise unofficial. Their events won't appear in the timeline and their characters won't be in the list, but they're fun reading nevertheless. All In A Day's Work (short story) - The story that started it all! Ash and his comrades-in-arms take an extremely parodic romp through a university under siege, enduring the terrors of lawyers, lunch ladies, and ... a roomful of bunnies. You'll miss all the in-jokes, but hey, it's a piece of history. For the status of stories in progress, and for stories awaiting editing, please consult my TTU To-Do List. There's always more on the way, and that will give you an idea of what to look forward to. Page last modified 2009-08-18. Design (c) 2001 Tad "Baxil" Ramspott. ALL LISTED MATERIAL IS © ITS AUTHOR.